A science-fiction fanzine is an amateur or semi-professional magazine published by members of science-fiction fandom, from the 1930s to the present day. They were one of the earliest forms of fanzine, within one of which the term "fanzine" was coined, and at one time constituted the primary type of science-fictional fannish activity ("fanac"). A fanzine is a non-professional and non-official publication produced by enthusiasts of a particular cultural phenomenon for the pleasure of others who share their interest. The term was coined in an October 1940 science fiction fanzine by Russ Chauvenet and first popularized within science fiction fandom, and from there it was adopted by other communities. The first science-fiction fanzine, The Comet, was published in 1930 by the Science Correspondence Club in Chicago. The term "fanzine" was coined by Russ Chauvenet in the October 1940 issue of his fanzine Detours  . "Fanzines" were distinguished from "prozines", that is, all professional magazines. Prior to that, the fan publications were known as "fanmags" or "letterzines." A neologism describes a relatively recent or isolated term, word, or phrase that may be in the process of entering common use, but that has not yet been fully accepted into mainstream language. Neologisms are often directly attributable to a specific person, publication, period, or event. In the process of language formation, neologisms are more mature than protologisms. 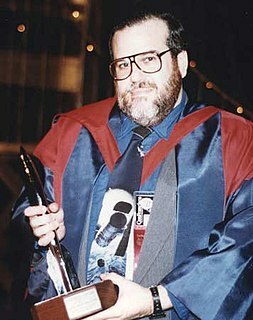 Louis Russell "Russ" Chauvenet was a champion chess player and one of the founders of science fiction fandom. Traditionally, science-fiction fanzines were (and many still are) available for "the usual," meaning that a sample issue will be mailed on request; to receive further issues, a reader sends a "letter of comment" (LoC) about the fanzine to the editor. The LoC might be published in the next issue: some fanzines consisted almost exclusively of letter columns, where discussions were conducted in much the same way as they are in internet newsgroups and mailing lists, though at a relatively slow pace. Since 1955, the annual Worldcon has awarded Hugo Awards for Best Fanzine; awards for Best Fan Writer and Best Fan Artist were added in 1967 and have continued since then. Worldcon, or more formally the World Science Fiction Convention, the annual convention of the World Science Fiction Society (WSFS), is a science fiction convention. It has been held each year since 1939. The members of each Worldcon are the members of WSFS, and vote both to select the site of the Worldcon two years later, and to select the winners of the annual Hugo Awards, which are presented at each convention. The Hugo Awards are given every year by the World Science Fiction Society for the best science fiction or fantasy works and achievements of the previous year. The award is named after Hugo Gernsback, the founder of the pioneering science fiction magazine Amazing Stories, and was once officially known as the Science Fiction Achievement Award. The award has been described as "a fine showcase for speculative fiction" and "the best known literary award for science fiction writing". The Hugo Award for Best Fanzine is given each year for non professionally edited magazines, or "fanzines", related to science fiction or fantasy which has published four or more issues with at least one issue appearing in the previous calendar year. Awards were also once given out for professional magazines in the professional magazine category, and since 1984 have been awarded for semi-professional magazines in the semiprozine category; several magazines that were nominated for or won the fanzine category have gone on to be nominated for or win the semiprozine category since it was established. The Hugo Award for Best Fan Writer is the Hugo Award given each year for writers of works related to science fiction or fantasy which appeared in low- or non-paying publications such as semiprozines or fanzines or in generally available electronic media during the previous calendar year. There is no restriction that the writer is not also a professional author, and several such authors have won the award for their non-paying works. The award was first presented in 1967 and has been awarded annually. During the 1970s and 1980s, some fanzines - especially sercon (serious and constructive) zines devoted to sf and fantasy criticism, and newszines such as Locus - became more professional journals, produced by desktop publishing programs and offset printing. These new magazines were labeled "semiprozines", and were eventually sold rather than traded, and paid their contributors. Some semiprozines publish original fiction. The Hugo Awards recognized semiprozines as a separate category from fanzines in 1984 after Locus won the award for best fanzine several years running. (See Hugo Award for Best Semiprozine). Well-known semiprozines include Locus, Ansible , The New York Review of Science Fiction , and Interzone . In science fiction, sercon is "serious and constructive" criticism, often published as science fiction fanzines. The term was originally coined in the 1950s by Canadian fan Boyd Raeburn as a pejorative to mock those fans who took science fiction, its criticism, and themselves too seriously. Fantasy literature is literature set in an imaginary universe, often but not always without any locations, events, or people from the real world. Magic, the supernatural and magical creatures are common in many of these imaginary worlds.It is a story that child and adults can read. Locus: The Magazine of The Science Fiction & Fantasy Field, is an American magazine published monthly in Oakland, California. It is the news organ and trade journal for the English language science fiction and fantasy fields. It also publishes comprehensive listings of all new books published in the genres. The magazine also presents the annual Locus Awards. Locus Online was launched in April 1997, as a semi-autonomous web version of Locus Magazine. Amateur press associations (APAs) publish fanzines made up of the contributions of the individual members collected into an assemblage or bundle called an apazine. The first science-fiction APA was the Fantasy Amateur Press Association (FAPA) formed by a group of science-fiction fans in 1937. Some APAs are still active as hardcopy publications, and some are published as virtual "e-zines," distributed on the internet. The term "fanzine" is also used to refer to fan-created magazines concerning other topics: the earliest rock-and-roll fanzines were edited by science-fiction fans. A significant part of modern computer/Web/Internet slang, abbreviations, etc. is derived from the jargon of the fanzine fans. See fanzine, fanspeak. The fanzine movement is now well represented on the Web; see webzine. Fanzine readers and producers naturally gather at science fiction conventions, but there are also small conventions dedicated to fanzines. The first fanzine-only annual convention was Autoclave, held by a Detroit-based fan group for several years in the 1970s. In 1984, the first Corflu was held in Berkeley, California. A second convention, Ditto, started in Toronto in 1988. Both of these conventions continue to take place each year. See also: Category:Science fiction fanzines. Steven H Silver is an American science fiction fan and bibliographer, publisher, author, and editor. He has been nominated for the Hugo Award for Best Fan Writer twelve times and Best Fanzine four times without winning. Emerald City was a science fiction fanzine published in print and on the internet by Cheryl Morgan. She had assistance from Kevin Standlee and Anne Murphy. The magazine published 134 regular issues and 6 special issues between September 1995 and October/November 2006. Emerald City received several Hugo Award nominations during its run, winning once in 2004 in the Best Fanzine category. Patrick James Nielsen Hayden, is an American science fiction editor, fan, fanzine publisher, essayist, reviewer, anthologist, teacher and blogger. He is a World Fantasy Award and Hugo Award winner, and is an editor and the Manager of Science Fiction at Tor Books. He changed his last name to "Nielsen Hayden" on his marriage to Teresa Nielsen in 1979. Fanspeak is the slang or jargon current in science fiction and fantasy fandom, especially those terms in use among readers and writers of science fiction fanzines. Strange Horizons is an online speculative fiction magazine. It also features speculative poetry in every issue. The 48th World Science Fiction Convention (Worldcon), was ConFiction, which was held in The Hague, Netherlands 23rd-27 August 1990 at the Netherlands Congress Centre. This convention was one of the two Worldcons held in continental Europe, the other being the 28th World Science Fiction Convention held in West Germany. The 66th World Science Fiction Convention (Worldcon), also known as Denvention 3, was hosted in Denver, Colorado, USA on 6–10 August 2008, at the Colorado Convention Center and Sheraton Denver Downtown Hotel. The organizing committee was chaired by Kent Bloom. The attending membership at the convention was 3,751. Andrew Ian Porter,, is an American editor, publisher and active science fiction fan. The Millennium Philcon was the 59th World Science Fiction Convention, held from August 30 to September 3, 2001 at the Pennsylvania Convention Center & Philadelphia Marriott Hotel in Philadelphia, Pennsylvania, USA. The 42nd World Science Fiction Convention (Worldcon), also known as L.A.con II, was held August 30–September 3, 1984, at the Anaheim Hilton and the Anaheim Convention Center in Anaheim, California, United States. The 44th World Science Fiction Convention (Worldcon), also known as ConFederation, was held August 28 through September 1, 1986, at the Marriott Marquis and Atlanta Hilton in Atlanta, Georgia, USA. The convention was co-chaired by Penny Frierson and Ron Zukowski. Total attendance for the convention was reported as 5,811 members. The 45th World Science Fiction Convention (Worldcon), also known as Conspiracy '87, was held 27 August–1 September 1987 at the Metropole Hotel and The Brighton Centre in Brighton, England. The 46th World Science Fiction Convention (Worldcon), also known as Nolacon II, was held 1–5 September 1988 at the Marriott, Sheraton, and International Hotels, and the New Orleans Municipal Auditorium in New Orleans, Louisiana, United States. The chairman was John H. Guidry. The guests of honor were Donald A. Wollheim (pro) and Roger Sims (fan). The toastmaster was Mike Resnick. Total attendance was approximately 5,300. The 54th World Science Fiction Convention (Worldcon), also known as L.A.con III, was held August 29 through September 2, 1996, at the Hilton Anaheim, Anaheim Marriott, and the Anaheim Convention Center in Anaheim, California, United States. The convention was chaired by Mike Glyer. Total attendance was reported as 6,703 members. Clarkesworld Magazine is an American online fantasy and science fiction magazine. It released the first issue October 1, 2006 and has maintained a regular monthly schedule since, publishing fiction by authors such as Elizabeth Bear, Kij Johnson, Caitlin R. Kiernan, Sarah Monette, Catherynne Valente, Jeff VanderMeer and Peter Watts. Electric Velocipede was a small press speculative fiction fan magazine edited by John Klima. Published from 2001 to 2013, Electric Velocipede won the Hugo Award for Best Fanzine in 2009.